Oh man, I swore to myself that I would finish it, and even though it may not be very interesting or whatever, I am going to do it! So after having that wonderful boat tour, we only had one day left which we left for shopping. It was a long day. OMG. We went straight to the Malecon (Boardwalk). Oh, wait, not straight, we took the bus to Walmart (yes, Walmart) and bought a duffel bag. Then we took another bus into the downtown area and got off at the Malecon. Our goal this day was to shop for our souvenirs. We walked the entire length of the thing looking all over the place for knick knacks and doodads. Well, I totally wore the wrong shoes that day. My selection was not very big since I was still technically recovering from my toe surgery. And it was hot and wet. So I wore what I deemed my comfortable flats. Well, they are comfortable, as in, they are more comfortable at the end of party than my heels. But they have no cushion so they were painful after only a couple hours of walking. One of the nice things of the Malecon is that it has a love of art. There are statues all along boardwalk and some of them took me back to Guadalajara. Out in the plaza in front of El Hospicio Cabanas (which once was an orphanage and now houses Clemente Orozco’s murals) there is a collection of strange bronze statues by an artist named Alejandro Colunga. 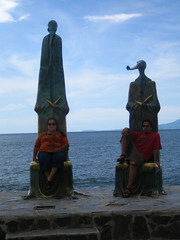 Well, his statues also line the boardwalk in Puerto Vallarta! They are mostly strange chairs and benches that invite visitors to explore and sit on them and pose for photos. Ours for the day start right here. They are very neat with exagerrated proportions. A repeat theme from what I remember in Guadalajara was a chair with ears which is really amusing. I also really like the feet poking out from under the robed seats. They are either barefoot, wearing fancy shoes, one was even an octopus arm! We enjoyed the statues and took photos of most of them. Not all of them, however are Colunga’s. The most famous one of all, actually, is “El Caballito” which is a kid riding a sea horse. 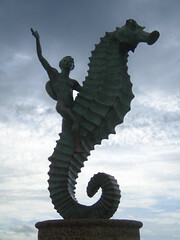 It has become Puerto Vallarta’s mascot and shows up on postcards and even local business logos. My dad took a photo here when he was a teenager and it made my mom feel the fuzzy’s to think that we were there. I really wish I had taken an actual photo posing with it now, but there are no time machines. I need to remember that I should pose for more photos and not spend the entire time behind the camera. But anyway, we plodded along and took lots of photographs not only of the statues but of the temporary art as well. There were stacked rocks on the beach. There were sand castles which seem to change regularly according to my recent searches online. There was also this very beautiful mermaid and merman statue, and an angel with arms to the sky. 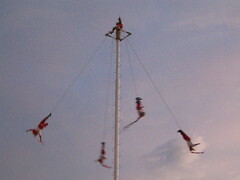 The shopping is what took us most of the day and is actually the least interesting, so I will skip ahead to when we sat down with our load and started to enjoy the sunset and the Voladores the Papantla. They perform regularly as the sun sets and we nabbed a spot where we could watch them easily. Here is video that Juan took while we watched. At this point we were exhausted and hungry. What I really wanted were tacos! I hadn’t had any street tacos in Mexico the entire time we were there! What gives?! So we tried to look around but didn’t find any street vendors with tacos. We eventually found a taqueria that had run out of carne asada. *hd* Let me say that again. A taqueria. With no carne asada. We were hungry, so we ate tacos al pastor. We watched the Simpsons in Spanish and ate our tacos. Then a weird commercial came on tv. A commercial for Halls with a limited time new flavor. Chela con limon. Friends, this means beer and lime. Because that is exactly what you want your breath to smell like when you have a sore throat and are walking around sick. Beer and lime! We cracked up and said we’d try to find some to bring back as novelties, but we didn’t really look too hard or run into any in the subsequent hours. It was time to go home so we took a taxi back and probably ended up at the pool place again. I can’t remember. Oh no… I packed and Juan knocked out because he had been fighting a cold the entire week. He kept it at bay but it was the end of our vacay and he was starting to let his guard down. So I let him sleep while packed our things since we needed to check out in the morning. We left to the airport and even with our new dufflebag, our one piece of luggage was too heavy. After searching the airport for an emergency bag, the lady at the baggage check-in brought out two trash bags and we put our bag of dirty laundry in it. Then she taped it up and put a ton of stickers on it. It was SO ghetto! hahaha! When we got onto the tarmac to board our plane, we saw that we were boarding a very pretty Tinkerbell 50th Anniversary Disneyland plane! It was so cute and everyone wanted to take photos, but as soon as the staff on the tarmac saw us, they very sternly told us that we were not allowed to take photographs. We snuck a couple, but we weren’t able to get Tink since she was at the front, where the employee was. 3 Responses to "Puerto Vallarta Finale"
Can I just say that the panoramic montage shot is teh ultra kewl? What a fab vacay. THANK YOU! I am really proud of it 😀 So proud in fact, that I have to hold myself back from explaining the entire process. lmao!